Piperales is a botanical name for an order of flowering plants. 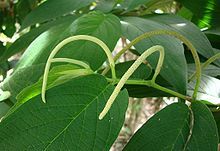 It necessarily includes the family Piperaceae but otherwise has been treated variously over time. Well-known plants which may be included in this order include black pepper, kava, lizard's tail, birthwort, and wild ginger. This page was last changed on 12 March 2013, at 08:52.